With the outgoing Dhumal government announcing all kinds of sops for various sections, particularly employees, on the eve of the Assembly poll with long-term implications, the government has a daunting task of managing the “empty coffers” at hand. The state Cabinet finalised and approved the Governor’s address to be delivered in the first Vidhan Sabha Session of the new government to be held at Dharamsala on January 8. The Cabinet, which met under the chairmanship of Chief Minister Virbhadra Singh, here today decided to maintain the status quo as on October 30, 2007, with respect to regularisation of teachers appointed through the Parent-Teacher Association in the Education Department. Mansa Ram, senior Congress leader and former minister, was sworn in as Protem Speaker by Governor Urmila Singh at a simple function at the Raj Bhawan here today. Mansa Ram takes oath of office as Protem Speaker at the Raj Bhawan in Shimla on Wednesday. The Supreme Court (SC) today stayed the Himachal Pradesh High Court (HC) verdict granting full-time daily wage status to part-time revenue chowkidars falling in class IV category with effect from February 27, 2004. Increasing limits of municipal areas in the state is a major challenge before the new government for developing urban areas in the state. The Himachal State Green Growers’ Association has urged the state government to save their agricultural land from being sold by banks. They had taken loans from banks for running their greenhouses several years ago on a high rate of interest. The Union Ministry of Agriculture has selected Himachal Pradesh for the Krishi Karman Award, 2011-12 in recognition of the special efforts made by the state Agriculture Department for increasing foodgrains production. In its first major administrative reshuffle, the state government today transferred IAS officers replacing loyalists of the previous BJP regime at key positions with its own trusted officers. With both Shanta and Dhumal factions virtually daggers drawn over the debacle in the Assembly poll, the BJP meeting at Una to look into reasons for defeat could witness major fireworks. With 15 private universities operating in the state, maintenance of quality in various courses had become a Herculean task before the state government. The mushrooming private universities in the state will come under the scanner of the Himachal Pradesh Pollution Control Board which will ensure that there is no flouting of norms so as to prevent environmental damage to the fragile hill ecology. Private universities in the state will not be able to conduct their own test for admissions as the State Private Educational Institutions Regulatory Commission making the national entrance test for both engineering and management streams mandatory from the 2013-14 academic session. Kewal Singh Pathania, a youth Congress leader and spokesman of the Himachal Pradesh Congress Committee (HPCC), has been appointed vice-chairman of the Himachal Pradesh Road Transport Corporation (HPRTC). Health Minister Kaul Singh Thakur held a meeting with officers to review the functioning of the Health and Family Welfare Department and the Medical Education Department here today. Sanjay Rattan, MLA, Jawalamukhi, today warned government officials to stop keeping away from offices during working hours. He told them to extend a helping hand to the common man coming to their offices. The Kangra police during the last 24 hours conducted raids at places under nine police stations of the district and recovered 1,18,120 ML illicit and country liquor. It registered 24 cases under Section 61-1-14 of the Excise Act and arrested 24 persons in this connection. The police found the body of an unidentified man aged about 50 years near a petrol pump near the bus stand at Suharghat, 42 km from here, today. Containing the deficit will be quite a task as the total annual impact on account of increase in salary and pension alone will be around Rs 900 crore. As most of the benefits were announced on the poll eve only three months ago, the impact will be felt towards the end of the current financial year as the gap in receipts and outgo will widen progressively. The fiscal deficit for 2012-13 will shoot up from the projected 2.7 per cent and could be as high as 4.5 per cent of the Gross State Domestic Product (GSDP). The immediate way out for the government is to get released the first instalment of Rs 500 crore of the Rs 1,000-crore development policy loan sanctioned by the World Bank for environmentally sustainable economic growth of the ecologically fragile hill state. It will help see through the current financial year without any hiccups on the financial front. However, for a long-term solution, major financial reforms will have to be undertaken to bring down the deficit by curtailing unproductive expenditure, downsizing the administration and revamping of the loss-making public sector undertakings as there is not much scope for raising resources through tax measures. The pension liability is growing much faster than salaries as is evident from the fact that the Bill has more than doubled from Rs 2,784 crore to reach Rs 7,500 crore and the pension liability has trebled from Rs 949 crore to Rs 2,784 crore and is set to cross Rs 3,000 crore in 2013-14. The state’s own resources grew by just Rs 1,729 crore over the past three years whereas the committed liabilities on account of salary, pension and interest on loans increased by 2,540 crore over the period. The state is heavily dependent on Central funds to bridge the gap. The new government must set up special cell to formulate schemes to secure maximum financial assistance from the Centre and also to monitor the implementation of centrally sponsored schemes. The poor financial health has affected the government’s capacity to provide requisite support to public sector undertakings (PSUs) and employees of some important organisations serving farmers like the Agro-Industries Corporation and the HPMC were not being paid their salaries regularly. Bold decision will have to be taken and the long-drawn exercise to close down and merge PSUs, which were beyond redemption, has to be completed. The state has made a total investment of Rs 1,878 crore till March 31, 2011, in 25 PSUs that have accumulated losses to the tune of Rs 1,666 crore, with the state electricity board topping the list with a loss of Rs 894.15 crore, followed by the state road transport corporation Rs 576 crore. Immediate steps are required to bring in professionalism in the management and functioning of government companies. Focus should be on securing the arrears of the state’s claim in the BBMB projects in accordance with the Supreme Court verdict. The amount worked out by the committee set up for the purpose is Rs 4,250 crore but the Centre had reduced it by Rs 850 crore taking certain other aspects into consideration. A committee was set up under the chairmanship of the Chief Secretary to examine all relevant aspects, including legal issues, on this matter and submit recommendations within three months. The Cabinet gave its nod to create a post of naib tehsildar (election) in the office of the Chief Electoral Officer for successful implementation of the Systematic Voters Education and Electoral Participation (SVEEP) project started by the Election Commission with a view to educate, provide training and ensure maximum participation of voters in the electoral process. The Cabinet decided to amend the Recruitment and Promotion Rules of Director, Prosecution, in the Home (Prosecution) Department. The Cabinet has also decided to constitute a sub-committee of three ministers - Kaul Singh Thakur, GS Bali and Mukesh Agnihotri - for setting up certain principles on policy for regulating transfers of employees of the state government. The Cabinet also gave its approval for hiring of a Mi-172 helicopter of Pawan Hans Helicopters Ltd for five years with effect from January 1, 2013, on wet lease by the state government. It also decided to create the post of engineer-in-chief (designs and quality control) from January 1 to June 30 and cease the post of the engineer-in-chief (projects) from January 1 onwards. Chief Minister Virbhadra Singh was present at the ceremony. The Protem Speaker will administer oath to new elected MLAs on the opening day of the winter session of the Vidhan Sabha commencing in Dharamsala on January 8. The elections of the Speaker will also be conducted by him during the session. Mansa Ram is the senior-most member of the Vidhan Sabha. He was first elected from Karsog (SC) seat in 1967 as an Independent. He was re-elected in 1972 on Congress ticket and remained a minister of state in the ministry headed by Dr YS Parmar. He lost the 1977 elections, but was re-elected as an Independent member in 1982 to become a Minister of State in the Ram Lal ministry. He was elected again in 1998 on the Himachal Vikas Congress (HVC) and later joined the BJP and remained a Cabinet minister in the BJP-HVC ministry. He contested the 2012 Assembly elections on Congress ticket and got elected for the fifth time. A Bench comprising Justices TS Thakur and FMI Kalifulla passed the order on a petition filed by the state government and the Deputy Commissioner of Kangra district, challenging the July 20, 2012, judgment of the HC. The Bench also issued a notice to 16 revenue chowkidars, who had won their case in the HC, seeking their response to the state government’s contentions. In the verdict, the HC had also directed the government to pay them all consequential financial benefits admissible to daily wage workers, including the arrears of pay, besides considering their case for regularisation on the completion of eight years of service on daily wages. Appearing for the petitioners, advocate Mohan Lal Sharma contended that the HC verdict ran counter to the policy decisions taken on September 22, 2011, and July 7, 2012. In these decisions, the state government had sanctioned a budget grant for left-over part-time revenue chowkidars in anticipation of their conversion into daily wage employment. However, the policy had made it clear that part-time revenue chowkidars would not be entitled to any financial benefits like arrears upon their conversion to daily wage revenue chowkidars from any date prior to their actual assumption of duties as daily wagers. “Since revenue chowkidars have worked as part-time prior to their conversion into daily wagers, they are not entitled to any financial benefit like arrears etc,” the state government contended. The growth of urban areas in the state is limited to the unorganised sector as the government has failed to increase the limits of these areas. The previous government even curtailed the limits of the Town And Country Planning Department in regulating the urban growth around towns in the state by excluding those bringing up houses in less than one kanal for getting their construction map approved from the department. 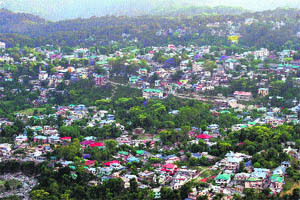 Dharamsala town is the classic illustration of how the failure of the government to increase the limits of the municipal council, has led to an unorganised growth around the town. Ram Nagar, Sham Nagar and Dari are the three areas that have at least 40 per cent of the total population of Dharamsala town. Though these areas are virtually the part of Dharamsala town and the entire pressure of population in these areas comes on the town, they are still panchayats. The previous government also tried to increase the municipal limits of Palampur, another significant town of Kangra district. However, the move met stiff resistance from villages around Palampur and had to be dropped. The reason why people did not want to be a part of the municipal council was that they feared that they would lose the benefits being given to them as panchayats or classification as a rural area. Many government schemes as the National Rural Health Mission (NRHM) and the MNREGA were being implemented in rural areas. People who get employment under the MNREGA do not want their villages to be included under the category of urban areas. However, the failure of the state to increase the municipal limits was depriving it of many schemes floated by the Union Government for development of urban areas. The Centre has floated many schemes for development of urban areas. However, none of the Himachal towns, but for Shimla, falls under the criteria fixed for extending the benefits of schemes due to the lesser population. The state government can get funds from the Centre for developing satellite townships and creating modern infrastructure in urban areas if the population of towns is increased by including adjoining areas in towns. Poor infrastructure in urban areas or major towns in the state was also hurting tourism, which is a major source of earning for a large number of people of the state. Due to unending traffic jams, lack of parking places and poor basic amenities in most of the tourist towns of the state many tourists are opting for Jammu and Kashmir. This winter the tourism was lean in hill stations of Himachal. Lack of control by authorities has also led to mushrooming of unplanned colonies around towns. These illegal colonies were putting pressure on the basic infrastructure and have converted many towns of the state into urban slums. A meeting of the association here yesterday adopted a unanimous resolution saying that despite their repeated representations and requests, the former BJP government had promised to solve the issue, but failed to take any action in the matter and now the Sub-Divisional Magistrate had already issued orders for the recovery of their loans by the sale of their land. It said the move would affect their families. They had taken loans for setting up greenhouses under the National Horticulture Mission under which loans were given on high interest rates. But they were neither given any training or expertise for running these greenhouses, nor provided any technical guidance by the department concerned at all, resulting in a gradual fall in their annual income and their failure to repay their loan instalments. The resolution said the government or the department also did not make any arrangements for marketing and providing deep freezers to ensure good return to them despite their hard work. Members of the association said a deputation of the state association in August last met Congress general secretary Rahul Gandhi and he had given them an assurance to look into the matter. They had also sent detailed representations to AICC chief Sonia Gandhi and the Prime Minister on this issue. A Central team had then visited the state to study the problems faced by them, and had, in its report, confirmed that no technical guidance was provided nor any marketing support given to farmers and this had put them in a crisis. Leaders Ram Krishan Sharma, Succha Singh, Kushal Singh Chandel, Kamal Thakur, Jeet Ram, Rajesh Thakur, Anil Kumar, Jagat Pal, Narender, Hari Krishan Bhadole and Swatantra Sankhyayan were among those present. It has specially commended its performance in wheat production and productivity. The award will be presented by the President of India on January 15, 2013, in New Delhi. The award consists of a trophy, citation and cash award to be used for improving the working environment in the department. Ashish Bahuguna, secretary, Union Ministry of Agriculture, has communicated the decision to the state government and congratulated the entire team of the department for its efforts in extending technological inputs and services to farmers leading to outstanding wheat production in 2011-12. Spokesperson of the department said in the last three years, production had increased from 11.11 lakh tonne to 15.54 lakh tonne. Among major food crops, wheat production increased from 3.81 lakh tonne to 6.33 lakh tonne, maize from 5.43 lakh tonne to 7.15 lakh tonne and rice from 1.05 lakh tonne to 1.31 lakh tonne. The vegetable production had increased from 12.0 lakh tonne to 13.56 lakh tonne generating a revenue of Rs 2000 crore annually. Besides this, the department had also done commendable work in promoting polyhouse cultivation, micro irrigation, organic farming and soil health management. The central leadership of the BJP, including Kalraj Mishra, national vice-president and in charge of party affairs in Himachal, Shyam Jaju, national BJP secretary, and Ram Lal, national organising secretary, will be present at the meeting to be held at Una tomorrow. While state BJP chief Satpal Singh Satti will be present at the important meeting, former Chief Minister PK Dhumal and Rajya Sabha MP Shanta Kumar are likely to stay away. It is after taking feedback from each candidate that various issues would be placed before the core group, where both Shanta and Dhumal would be present. With both factions blaming each other for the defeat in the Assembly poll, the meeting could see tempers running high, especially those who lost owing to undercutting. All the 68 Assembly candidates, constituency presidents, district BJP chief and state office-bearers of the party will attend the meeting. It is for the first time that the state BJP is meeting to look into reasons for the party’s defeat. So far, only the BJP Legislature Party meeting has been held where Dhumal was unanimously asked to lead the party in the House. While leaders belonging to the Dhumal faction have blamed Shanta for the party’s poor performance in Kangra, loyalists of the Rajya Sabha MP are accusing the former of the same. Dhumal without naming anyone has said the party’s better performance in Kangra could have helped the BJP to win the elections. Some of the Shanta loyalists, including former ministers Kishan Kapoor and Ramesh Dhawala, are likely to air their grouses openly. While Dhawala is blaming former minister, Ravinder Singh Ravi for damaging him, Kapoor too is likely to point fingers at Dhumal for backing a rebel, Kamla Patyal, from his constituency. Even in Sujanpur it was a Dhumal loyalist, Rajinder Rana, who won as a rebel, ensuring the defeat of BJP candidate Urmil Thakur. Leaders could also take a decision on initiating disciplinary action against those who were indulging in a blame game and openly accusing senior leaders for the defeat. Satti is likely to discuss the issue with central leaders. The previous BJP government had constituted the HP Private Educational Institutions Regulatory Commission to ensure stipulated norms of various regulatory bodies like the All-India Council for Technical Education, the Pharmacy Council of India and the Bar Council of India, observed by various private universities. Though the commission has been trying to streamline the working of these universities, it was observed that some universities were taking an exceptionally longer time to make available requisite documents to the University Grants Commission (UGC), which grants approvals to a university after inspecting its faculty, infrastructure and available facilities. With the regulatory commission yet to tighten its noose around universities that are lax in seeking UGC approvals, quality education will continue to suffer. Universities failing to appoint trained faculty, requisite infrastructure, adequate libraries and laboratories, as per the UGC guidelines will effect quality education if left unaddressed. While the APG University, Shimla, has only sent the ordinance to the UGC and it was yet to send a copy of the Act despite its gazette notification in June last year. ICFAI University had failed to admit students for the current session and it too had failed to provide information for the purpose of inspection by the UGC. The Maharishi Markandeshwar University, Kumarhatti, too was yet to provide the information sought by the UGC. The university was notified in June 2010 and has been functional for the past three years now. In case of other private universities the process to conduct UGC inspections was underway with inspection committees having been constituted after completion of other formalities. It was interesting to note that despite universities failing to fill the stipulated seats allotted to them in various courses, a vast number of students were seeking admission in universities of neighbouring states, thus indicating their lack of faith. It remains to be seen what steps the state government takes to reaffirm the faith of students on these universities, especially after a recent Punjab and Haryana High Court judgment making mandatory for all universities to take prior approval of the AICTE before initiating any technical course. Addressing a press conference here today, newly appointed Chairman of the board Kuldeep Singh Pathania said nobody would be allowed to flout the rules and regulations enacted by Parliament and the Legislature. He made it clear that private universities would have to abide by the rules and regulations or else face strict action. He admitted that reports of some universities flouting norms and misrepresenting facts had been received and a team of officials from the board would visit the site today itself. “Environment is our biggest resource and there can be compromise on that account. We welcome industry in the state, but certainly not at the cost of environment,” he clarified. He said thrust should be on setting up of a pollution-free industry so that the quality of air and water did not deteriorate further. While admitting that the quality of air and water in the state had deteriorated over the past few years, he remarked that every possible step would have to be taken by the board to protect environment. “Today it is difficult to drive on the highways with windows open as the pollution level is so high due to increased volume of traffic,” he said. He lamented that the board had failed to play an effective role during the last five years. “It is a statutory body which has to play an effective role, and we will constitute the board after seeking the approval from the Chief Minister, who is Minister for Environment,” he stated. Member secretary of the board Sanjay Sood said the National Environment Engineering Research Institute (NEERI) had conducted an environmental study of the Rohtang area. “There is no alarming indication, but the fact remains that if steps are not taken there can be deterioration over the next few years,” said Sood. The decision is part of the norms for admission notified by the commission and had been taken after an exhaustive consultative process with all stakeholders with an objective to have a transparent and uniform cross-comparable admission process in the state. As per the decision, admissions to all BTech-level engineering programmes will be solely on the basis of the AIEEE, which has now been renamed as JEE (Main). Admissions to management courses will be carried out on the basis of the Common Management Admission Test (CMAT) and universities will have to notify this requirement in advance on their websites for the information of students. The commission has issued circular directing all private universities to strictly adhere to the admission norms as prescribed by it and ensure that admissions to engineering and management courses are made only through valid scores of JEE (Main) and CMAT, respectively, during the academic session 2013-14. However, it is learnt that the commission may consider any one of the five national entrance examination (s) viz, CAT (conducted by IIMs), MAT (conducted by AIMA), XAT (conducted by XLRI), ATMA (conducted by AIMS), JMET (conducted by IITs) or state-level entrance test HP-MAT conducted by HPU for admission to management courses (MBA/PGDM) during 2013-14. Pathania started his political career in 1993 as a National Students Union of India (NSUI) activist. He was district president of the NSUI from 1993 to 1995 and state general secretary of the NSUI from 1995-96. He was national general secretary of the NSUI from 1997 to 1999 and state president of the NSUI from 1999 till 2007. Hailing from Shahpur (Rait) in Kangra district, Pathania got the Best NSUI State President Award in 2001. He was the only member from Himachal Pradesh who participated in the Dandi Yatra of 76 km (Sabarmati to Dandi) and was bestowed the Yuva Puraskar. The government today appointed Hardeep Bawa, president of the state unit of the Indian National Trade Union Congress (INTUC), as Chairman of the Himachal Pradesh Building and Other Construction Workers Welfare Board. He has replaced Ashok Purohit who held the position during the Dhumal regime. Addressing the meeting, he directed the officers to complete the ongoing construction work of health institutions in a time-bound manner. He directed the department to appoint doctors to fill vacant posts in Primary Health Centres and also post health workers in all the health sub centres. more. He asked them to maintain transparency as they would be accountable for their work. Earlier, Rattan was accorded a rousing reception at the Dehra market by Congress workers and his supporters on his arrival there for the first time after he was declared elected. 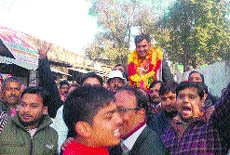 Rattan is the only Congress MLA from Dehra subdivision who was elected among the three constituencies. The two other constituencies were bagged by BJP candidates. Kangra district police chief Diljeet Singh Thakur today said the police conducted raids at four places under the police station here, five each under Nurpur and Jawali police stations, two each under Nagrota Bagwan and Indora police stations and three under Palampur police station. He said investigation was in progress. Reports said the police arrived on the spot after someone phoned to say that a person was sitting still near the petrol pump and seemed to have died due to the severe cold during the night. The body was in a sitting position and a blanket was wrapped around it which could hardly have saved him from the freezing cold. The body was brought to the Regional Hospital here for postmortem and has been kept in the mortuary for identification.